Well its the start of another week and i have 2 new challenges to share with you today...... but only one project! 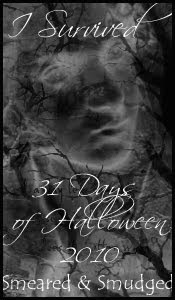 SMEARED INK are sponsoring MACABRE MONDAY..... so my project for SMUDGY ANTICS and MACABRE MONDAY are one and the same! Congratulations to the winner and top three of the Colour Challenge! The challenge theme this week is "EMBELLISH IT". For this challenge you MUST use at least 3 EMBELLISHMENTS. Bring on the flowers and bling. Use up your ribbon and lace. Find a spot for brads and gems. Heck, add hardware if you want! Make your project simple or feel free to go over the top. Just remember to use a stamped image (digi or rubber), 3 embellishments, and be sure to read and follow the challenge rules posted. I have stamped and masked images from SMEARED INK.... coloured with promarkers, & copious amounts of brown and black ink to get that smeared and smudged look. and then spritz and sponge your way to a distressed masterpiece! I mounted my coloured image onto gold mirri card and distressed the hell out of it..... i used the paper from a chocolate box....i love this stuff...it crinkles up so well. I used a couple of die-cuts (grunge board, painted and distressed to look like rust) and a plastic word plaque that i painted then distressed to look like old metal. I mounted it all onto black card stock. So you guys can combine challenges..... 3 embellishments....and distressed..... and you can win a SMEARED INK VOUCHER...... from either or both challenges! Your card is Poe-sitively terrific!! I like the fact that it's WAY over on the macabre side of the scale (with zombie being at one end and butterflies being at the other). Thanks for playing with us at CCCC. 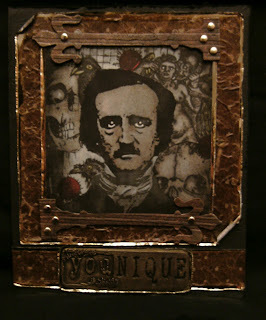 Well, your card is definitely "Poe-tic"! I saw this at MIM! Great job! It's amazing what you've done with all the distressing! Incredible work. Thanks for sharing at The Perfect Sentiment. 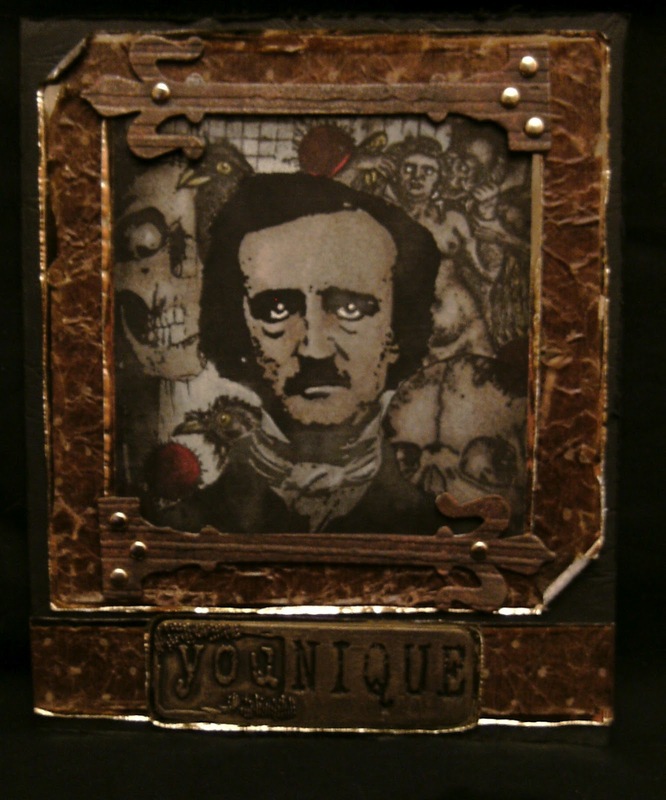 Great card with some wonderful distressing. Thanks for sharing with us at Corrosive challenges and good luck. How totally cool is this!?! love the distressing - amazing - thanks for joining us this week at The Perfect Sentiment! You do the coolest art I have ever seen! I'm not sure how to comment except to say that you are wonderfully different! Thank you for entering ATCs Card with Attitude Challenge. Please enter your card in our Fat Pages Challenge too. We now have Top 3 winners! We will start a new challenge on June 1st and go back to our every 2 weeks at that time. So nice to see your fab artwork! Beautiful art...love the distressing! I saw your card at MIM! 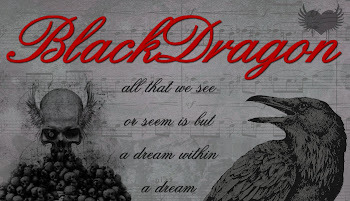 Black Dragon, you are such an inspiration to me! I truly love this! I love how you have combined all those stamps! This turned out way cool looking, and fits you well bc of the senti... YOUnique! I saw this on MIM. Well , again I say ..not my style but,WOW , I am full of admiration for the creator of this fabulous piece of art . AMAZING . Distressing and inking are definitely your thing. I like the sentiment you used too. Thanks for playing @ The Perfect Sentiments. Eine tolle Karte. Passend für einen Mann. The distressing and inking is really cool. You did a great job. Thanks for joining us at the Perfect Sentiment. very unique thanks for joining along with the perfect sentiment this week. Great distressing! Thanks for sharing at Perfect Sentiment. 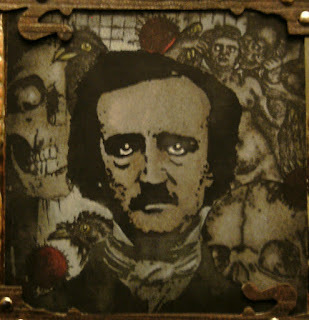 I love the skull behind Poe..nice..vintage is always a eye grabber and yours is wonderful. 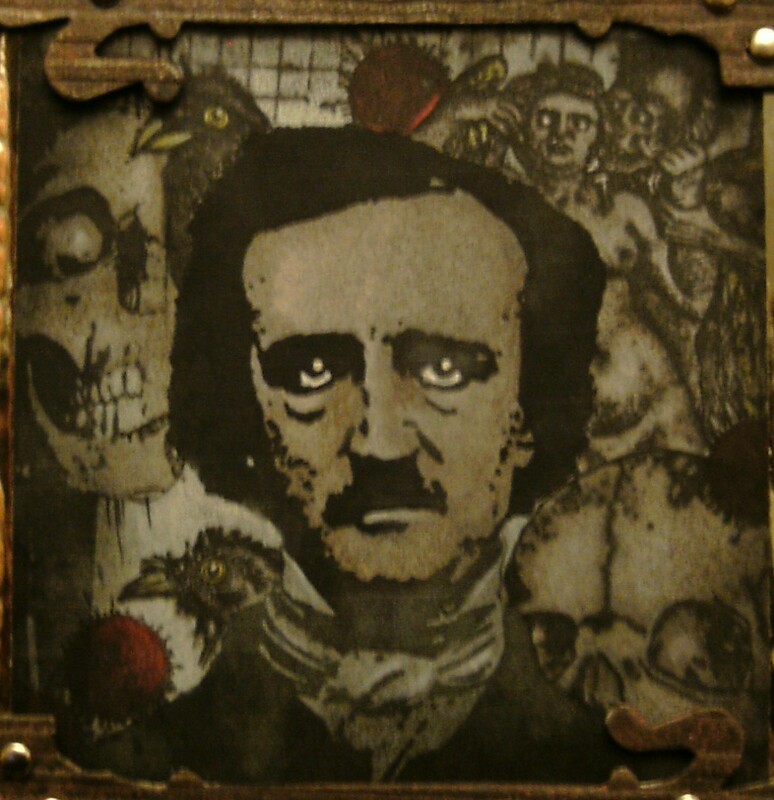 I love the glow in Mr. Poe's eyes. Wow! Fabulous card. Love the vintage look and your image is very "eye catching." Thanks for playing along at Perfect Sentiment. What a beautifully distressed piece! I really love the masking you've done too....you are truly a MASTER! Amazing work, my friend! This is so cool! I love the artsy feel of it. Super creative! I found your blog through Make it Monday. Thanks for sharing. I always look forward to your weekly MIM entry. I just love your creative style. So creative as always and Poe front and centre-love the background i I agree with the wrappers and what they pack chocolate with-great work! 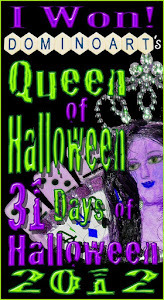 Very striking card, Thank you for joining us at Joanna Sheen Challenge. Good luck in the draw.